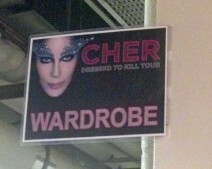 Can I “CHER” Something With You? To my theater family near and far. Special thanks to the singers, musicians, stagehands, and production team of the Cincinnati Opera’s Der Rosenkavalier, for all of your support during the second round of The Crafts Report cover contest. Thank you for listening to my campaign speech in between your cues and scenes and for your votes. My theater family grows with every production I work. Thank you to all of my theater family, new and old!